Today officially starts the first day of fall, but Michael Kors has me dreaming of spring with his Ready-To-Wear runway collection for spring 2015. Staying true to his aesthetic, the designer debuted a collection at New York Fashion Week that is both classic and feminine, and of course floral-inspired. Which got me thinking - just because it’s fall doesn’t mean we have to automatically put away our flouncy floral skirts. By adding opaque tights, closed-toe heels, and motorcycle jacket we can update the spring-time look to a cozier version totally appropriate for fall. Of course adding a sweater, booties, scarf, coat, and gloves can also take your floral skirts way into the new season. 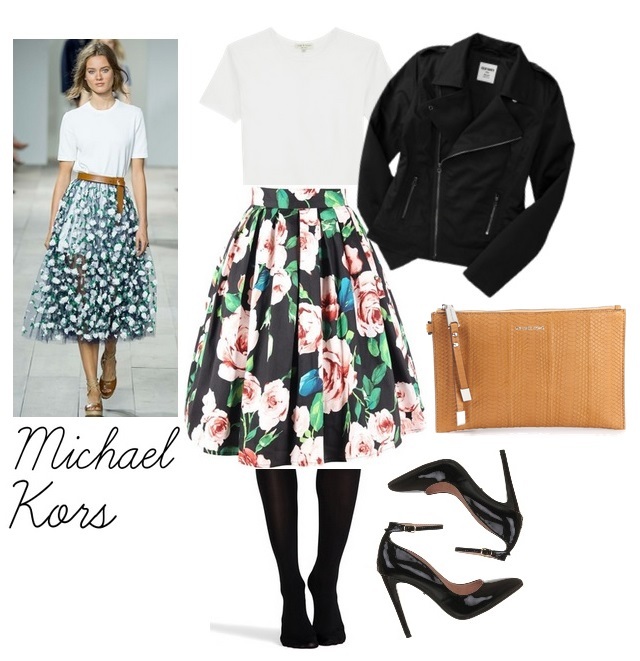 How would you wear a floral skirt for fall? Great skirt and I love the addition of moto jacket and tights. Black tight will definitely be in heavy rotation for me this fall. I am loving this entrie ensemble! That floral midi skirt is amazing - love it. Thanks lady! I love how feminine midi skirts are. A girl after my own heart! I LOVE full skirts - this one for the recreation of designer look is just fabulous!! Hope you are having a wonderful day!